Today, with the tremendous increase in consumption and pollution, there are growing concerns about the environment. It is therefore very important to offer to the public products using less and less polluting chemical substances. This is why we have chosen the espadrille, a shoe that meets all environmental criteria. Jute is used to make the soles. The use of jute is beneficial for the environment since this natural and renewable fibre is also completely biodegradable and can be used as a fertilizer. This is one of the most environment friendly material as its cultivativation does not require pesticides and its transformation does not require environmentally harmful products unlike cotton, the conventional cultivation of which uses 24% of the pesticides sold in the world and represents only 2.4% of the agricultural area in use. Few materials are as environmentally safe as jute. Flax is the oldest textile material. It is also one of the few textile fibres producing plant gowing in Europe. The technical charateristics of flax fibres are rather exceptional. Flax can absorb a lot of water and its fibre is very strong and fine. Unlike its synthetic competitors, this fibre is not affected by UV radiation from the sun. 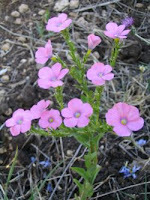 Flax cultivation and transformation are very safe for the environment. An environmental balance established over a period of a year and a half shows that flax wins one of the first places as far as compliance with environmental legislation is concerned. This is why it is so popular today. 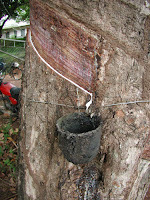 Rubber is an elastic waterproof material made with the latex produced by the rubber tree growing in southern regions. It is first dried and then purified by a boiling and cleaning process. Natural rubber has properties that cannot be matched by synthetic rubber made from oil. Its production is less energy-consuming and polluting than synthetic rubber.